“I have a large collection of canned goods in a storage room and I decided to get a good manual can opener in case a string of hurricanes decide to come through my neighborhood like they did a few years ago” (and the power went off for a week). “Or maybe…a prolonged period of civil unrest should pop up and the stores are all looted. “So I went down to my nearest hardware store and looked around. There was only one can opener on the wall and I checked it out. The name is SWING-A-WAY, the only one left on the shelf. It looked sturdy with white comfortable plastic grips. I took it home and tried it out. The initial cut was like slicing through butter. It was smooth, with little effort on my part. I opened two more cans with the same result. It was beautiful, with little, the gold standard of can openers. I decided to get six more. “I shopped around and found another store that just got in a supply of Swing-A-Ways, same model. I bought one and took it home for a tryout. It felt different. I tried the first can and it took more pressure to break through the lid. After a few turns it stopped. It would not budge. I took it out and started again. Same results. With two different tries I got the same results, two cans with three sections, less than an inch each. Unopened. I examined both can openers carefully although they looked identical. The only printing on the opener was the name and some words underneath. Under the Swing-A-Way were the words ‘made in USA’. Then I checked the other word that was underneath the false Swing-A-Way. It was, in small letters. ‘China’. NOTE: The same problem still exists, especially with products from third world countries in every category-food, clothes medicines, toys, etc. Last week I decided to try another can opener at the grocery store and took it home. It had the label that read EZ-DUZ-IT, THE BEST CAN OPENER MADE! 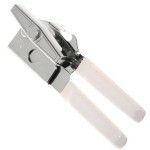 MADE IN THE U.S.A.
TODAY: A new day for manual can openers in America has arrived. The new EZ-DUZ-IT can opener performed perfectly. It broke through the lid with ease and cut smoothly around the lid effortlessly, making a clean cut. I will buy more of these can openers my next trip for groceries. Price was under $7.00 for this model although it may cost more at other locations. Click on image for larger view. Manufactured by John J. Steuby Co. 6002 N. Lindbergh, St. Louis, MO. 63042. In addition was the FAX 314 895-9814, WWW.STEUBY.COM, SALES@STEUBY.COM. 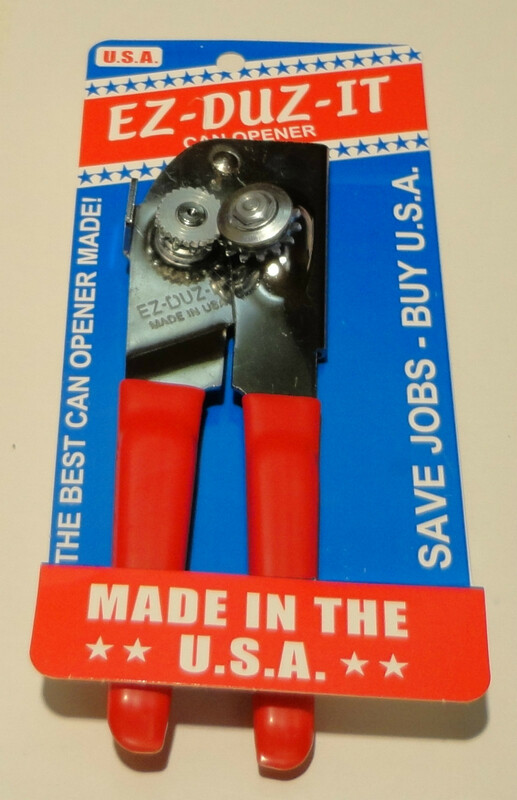 As I checked out the internet, I found other brands of manual can openers advertising that they, too, are “proudly made in the USA”. There are a number of companies in China and other third world countries that are currently making substandard and dangerous products, then shipping them to American stores. Please only buy those items, including food-especially food, from sources that originated in the USA. Buy American. It’s patriotic and can save your life.